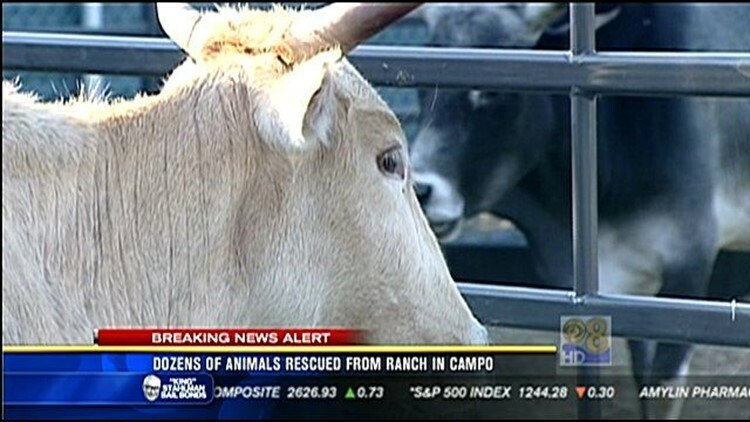 CAMPO (CNS) - Deputies and animal-welfare officers raided an East County ranch Friday and seized a variety of livestock, including sheep, goats, horses and cattle, that were ill and malnourished due to protracted neglect, authorities reported. A total of 58 creatures were confiscated from the Buckman Springs Road farmstead, which has been the subject of prior animal-cruelty complaints, according to sheriff's officials. The operation stemmed from an investigation that began early last month, when deputies and county animal control officers responded to a report that livestock carcasses had been dumped on a dirt road just west of the Campo-area ranch. The personnel arrived to find nine dead goats and a llama so badly ailing it had to be euthanized, officials said. Postmortem tests on the animals -- which had been living at the nearby ranch -- determined that none of them had any diseases or other conditions that could have contributed to their deaths and that they most likely had starved to death. In response to the livestock fatalities, county officials provided the ranchers with detailed information on the proper feeding and care of farm animals. The livestock seized Friday morning were taken to a Bonita-area county shelter, where veterinarians will try to nurse them back to health, authorities said. The District Attorney's Office will review the case and determine whether to file criminal charges against the operators of the ranch, according to sheriff's officials.